MAH Sing Group Bhd has bought a 2.3ha freehold land next to its existing Sri Pulai Perdana 2 project for about RM2 million. This brings the total land size of Sri Pulai Perdana 2 in Johor Baru to about 29ha, with RM225 million estimated gross development value. 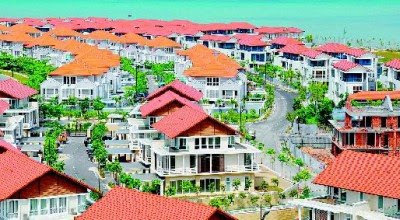 “The increase in gross development value of Sri Pulai Perdana 2 arising from future development on the (purchased) land is expected to enhance the future profit and net assets of Mah Sing Group,” the company said in a statement to Bursa Malaysia. Heat absorbers: Concrete surfaces absorb heat, causing the heat island effect. If roofs and buildings are painted white, they will reflect the heat instead. The stifling heat might have gotten some of us thinking about how best to cool our homes without pushing up the electricity bill in this time of financial crunch. Dr Gary Theseira thinks he has the answer – simply reflect the light and heat back to the atmosphere. He suggests that we look at the potential of our roofs – that space that is directly exposed to the sun and absorbing vast amounts of heat during the day – as a reflector. He says conventional tiles absorb heat as almost all are made from material that do not reflect heat and the heat absorption is intensified manifold with the dark-coloured tiles preferred by most Malaysians. The botanist with the Forest Research Institute of Malaysia (FRIM), who has represented Malaysia at several United Nations climate change negotiations, is frustrated that no one take is taking him seriously about making changes to our roofs. Theseira feels the world is giving disproportionate attention to the loss of white snow cover at the poles, and is failing to address the heat island effect of cities at the Equator, where the heat intensity is 2.5 times higher than at the pole. “If we at the Equator bounce off the light and heat back to the atmosphere, that would really help,” he explains. Having designs on the roof as a climate change mitigating tool is not a new idea but it hasn’t caught on in a big way. In fact, the roof is not the only building surface that can help lower the temperature of buildings. “In the Middle East and Mediterranean, for thousands of years, buildings have been traditionally white-washed to keep them cool in the summer,” says Dr Hashem Akbari, who heads the Heat Island Group of the Lawrence Berkeley National Laboratory at the University of California, Berkeley, California, in the United States. Akbari is known for his relatively simple idea to cool the earth’s urban surfaces: make all rooftops and paved surfaces white. He is pioneering the white-roof concept and recently launched the 100 Cool Cities programme to get homeowners to switch to white roofs or at least a cool-coloured roof. No cities have signed on, however, despite showing interest. “I am hoping to create an international programme to recruit as many large cities as possible. My current focus, in addition to the US cities, are China, India, Brazil and the Middle East. I would like to make sure that the building standards in all these countries prescribe white or cool-coloured materials for roofs,” he says in an e-mail interview. Akbari found that communities with white roofs and cool pavements are a few degrees cooler, thus requiring less air-conditioning in the summer. Also, a lower ambient temperature reduces the reaction rate of smog-producing pollutants, leading to better air quality. Akbari’s work shows that replacing 10sqm of a dark roof with a reflectivity of 0.15 albedo (reflecting only 15% of incoming solar radiation) with a white roof with a reflectivity of 0.55 will offset about one tonne of carbon dioxide (CO2) emissions. “If all cities in hot and temperate climates were to use white material on their roofs or cool-coloured materials, we can offset about 24 gigatonnes of CO2 emissions which is equivalent to over 10 years of emissions from all cars in the world. The current world emission is about 27 gigatonnes, ” he says. He says a white roof has an initial reflectance of about 0.7 to 0.85 albedo. Over time, its reflectivity drops (due to dust collection) to about 0.55 to 0.65 albedo, depending on the location and climate. Globally, roofs account for 25% of the surface of most cities, and pavement accounts for about 35%. He says some leading industries are pushing the idea while some, who are afraid of losing market share, resist. His colleague Arthur Rosenfeld, who is a commissioner with the California Energy Commission, told the San Francisco Chronicle in an interview, that the team estimated that a worldwide conversion to white rooftops would take at least 20 years. Rosenfeld said California is the only state to embrace white roofing, at least for commercial projects. In 2005, with the aid of Akbari’s research, the state passed a building standards law that requires all builders to first consider cool colours for major retrofits or new buildings. Akbari says the roofing industry responded well, designing new materials and cooler colours to appeal to builders and homeowners seeking cost-savings and ecological benefits. Cooler colours refer to paint with cool pigments that reflect more of the near-infrared part of the solar spectrum. Painting or coating roofs is one option, he adds. While costs (without incentives from the government) is prohibitive, there are Malaysians who have embraced the idea at their own expense. When Tony Cheah of Taman Tun Dr Ismail in Kuala Lumpur decided to renovate his single-storey link house two years ago, he came across a UV-resistant roof coating called Tileflex. “Replacing the whole roof would have cost me in excess of RM25,000, not to mention the mess I would have had to endure. I had no intention of changing the original tiles which were still in excellent condition,” he says, adding that he ended up paying RM6,500 and got a new coating for the roof in three days. While Cheah couldn’t specify the savings in electricity bill or provide a reading of the ambient temperature in the house post-renovation, he says the house “is considerably cooler”. Lim Voon Bin, director of Nuruf Sdn Bhd which distributes Tileflex, says electricity savings will be apparent in the long run. He claims the product reflects up to 3°C of heat. Lim ran a roof-making business for 30 years before he closed down his factory in Nilai in 2004 when he realised that he would be helping the environment if he could “restore roofs rather than replace them”. So far, he has restored 150 houses since 2005, as eco-consciousness takes root among Malaysians. Scomi Engineering is banking on its excellent delivery time track record to win the tender for the first phase, which will open in the middle of next month. Scomi Engineering Bhd is confident that it can win a US$2.5 billion (RM8.8 billion) job to set up a monorail system in Sao Paulo, Brazil's largest city, says president Hilmy Zaini. The tender for the first phase, which will open in the middle of next month, is part of a 100km monorail project to be commissioned by the State of Sao Paulo in preparation for the 2014 World Cup, to be held in Brazil. Scomi Engineering will be the systems supplier and designer of the project, while CR Almeida will work on the civil construction. The state government has earmarked some US$10 billion (RM35.2 billion) to design monorail lines and modernise its metro lines. The US$2.5 billion is for the first 45km of the monorail line. 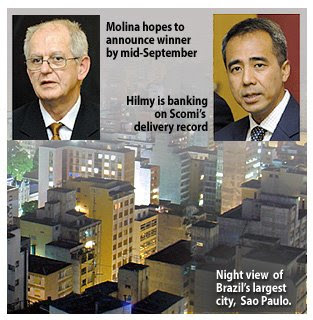 "We are banking on our excellent delivery time track record to be a main attraction, because of the June 2013 deadline the Brazilian authorities have, as well as the fact that we have a very strong civil construction partner in CR Almeida," Hilmy said. This in turn will provide numerous opportunities for implementing monorail systems in the 12 cities selected to host the games. The city of Sao Paulo is set to host the opening match. Scomi Engineering is hosting the Brazil Monorail Consortium delegation comprising officials from the transportation and planning departments of the city and State of Sao Paulo on a visit here since June 11. The visit is part of a fact-finding mission. The delegation will also go to India to view Scomi's project in Mumbai in addition to visiting Japan. The delegation will not only meet with embassies and senior management but will also stop by the Asian Oil & Gas exhibition, take a ride on the Kuala Lumpur Monorail and visit Scomi's North KL facility. Sao Paulo Metro's director of metropolitan transport planning and expansion, Jair Felipe Molina, said it hopes to announce the winner of the tender between end-August and mid-September and have construction start by January next year. SP Trans SP Brazil's director of transportation, Pedro Luiz de Bnida Machado, said there were also plans for another monorail line in the south zone of Sao Paulo, estimated to be worth US$4 billion (RM14 billion).